The San Francisco Bay Area is one of the most culturally diverse regions in the country. And therefore it should not come as any surprise that Ted's Video Services, based in Fremont, California, does a lot of international video conversions. You see, not all countries use the same video system. For example, here in the United States, we use NTSC (National Television Standards Committee), which is being replaced by the new digital ATSC (Advanced Television Standards Committee) system. Even the NTSC used in Japan is slightly different than the one used here. China and lot of countries in Europe, like England, use PAL (Phase Alternating Line). Some jokingly refer to PAL as "Perfect At Last" because it was created after NTSC, which had some inherent technical flaws. 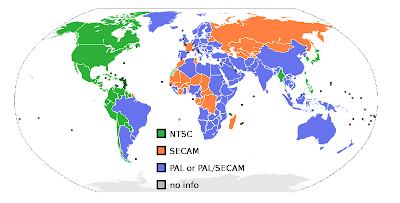 Other countries use SECAM, which stands for Séquentiel Couleur Avec Mémoire. You can probably guess where this system was developed. NTSC, PAL, and SECAM are the primary systems used in the world, but there may be variants of these systems like NTSC-M, PAL-N, SECAM-H. Curious to know which country uses which international video system? Simply do an Internet search for "international video standards". On a side note, commercially released DVD's may have DVD Region Codes and Macrovision copy protection that would also prevent you from watching the video in another country or copying it. Obviously, this is to address copyright issues and the fact that movies are generally released in certain countries before other countries. So although a VHS tape or DVD may look physically identical as any other one recorded in another country, you may not be able to play it here in the U.S, and thus you would need to have to have it converted to NTSC. If you have any questions about converting videos made in other countries, please feel free to contact Ted's Video Services at (510) 796-2200 or E-mail us info@tedsvideo.com.